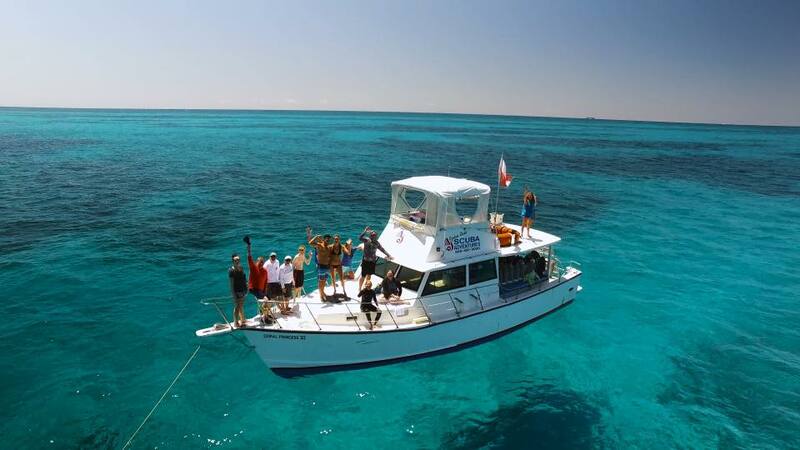 Simply The Best Location In The Upper Keys For Reef & Wreck Diving. Capt. Slate’s Scuba Adventures is located in the upper keys at MM90.7 in Tavernier just south of Key Largo on Tavernier Creek plans. As soon as you cross over Tavernier Creek Bridge we are directly on the left side of the road heading South, in the big yellow and blue buildings, directly on the ocean, you can’t miss us! We are in our 40th year diving the keys and running the best dive operation with our three custom built dive boats and experienced staff second to no one. We can’t wait to show you our 25+ dive sites. We are located within the Casa Mar Village shopping center also located directly on the water. The Village features distinct shops, including two restaurants, right next door to our store is the “What The Fish”, restaurant and café featuring gourmet food and snacks for your dockside dining or to take on your dive/snorkel/glass bottom boat charters. We have “Paddles” for all your paddle board, skateboard, kayak and outdoor adventure needs, also a fresh seafood market, Casa Mar Seafood, next to the market is Key Largo Bike and Adventure, booking bike tours throughout the keys and Cuba. For those who want to make the Keys your home we have Keys Properties real estate as well, and much more. Then after all your diving/snorkeling adventures you can sit on our beautiful sandy beach located beside the dive shop on the ocean and Tavernier Creek, a popular resting spot and wedding location for our land weddings! The fun never ends at Capt. Slate’s Scuba Adventures. We also have the “Creekside Inn” on property, a first class hotel! No driving from the hotel to the docks and store! Store your gear overnight in our huge secure storage area. We added our third boat a 30′ fast boat to our fleet and can run smaller groups quickly to all the wrecks including the Bibb, Duane and Eagle just south of Tavernier, join us for our ‘Wreck Trek” and dive all three in one day! We also cater to spearfishing and lobster charters and we know all the ‘secret’ spots! We still have our Glass Bottom snorkel boat the only combination snorkel/glass bottom boat in the keys. Also relax and experience our Sunset Cruise complete with snacks and rum punch! As always our highly qualified and experienced staff offers dive instruction with SDI, NAUI, PADI, SEI, DAN and more certifications for you to start or continue your dive education here. We are a state licensed NAUI, SDI, SEI Instructor Training Facility, with over 39 years of instructor training. Call now and “live the life most only dream of”! So what are you waiting for? Contact us and book your reef adventure or dive training with the Professionals at Capt. Slate’s Scuba Adventures. We treat you like the family you are to us. And Remember, a visit to Capt. Slate’s is not complete without the seeing the world famous “CREATURE FEATURE”. The 2-Tank Boat Dive - does NOT include air & weights ticket is sold out. You can try another ticket or another date. The 2-Tank Boat Dive - does include air & weights ticket is sold out. You can try another ticket or another date.